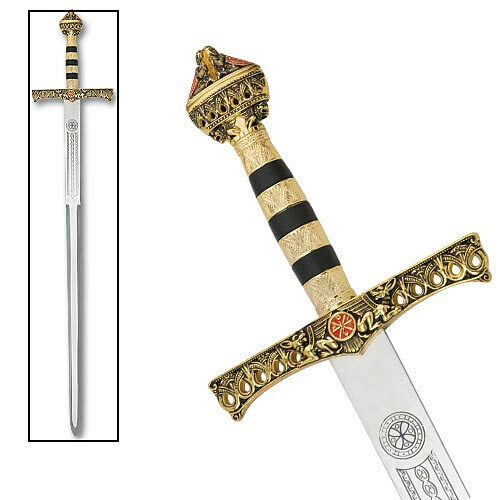 This historical sword is brilliant representation of the original piece wielded by noble gentleman. Constructed with a mirror polished, stainless steel blade with intricate laser etchings. The cast metal pommel and guards offer unique details derived from the historical pieces. Includes hardwood wall plaque. 45 3/4" overall, 35 1/8" blade. I am not going to lie I love this sword. But it isnt amazing. It is not sharp and the handle feels some what cheap but over all it is great for its price. Beautiful sword!!! Huge sword with beautiful detail on the hilt! The detail is incredible! Feels right in my hand. And the plaque will make it so all can admire it. But all in all awesome price, outstanding sword. i am super pleased. BUY IT!!! Great sword! Very large with beautiful detailing! Very high quality for an amazing price. I am very happy.